David Virtue, M.C.S., DD., was educated at Scots College in Wellington, New Zealand. He studied English Literature and Philosophy at Victoria University in Wellington before going on to London Bible College, London, England where he completed his Diploma in Theology. He continued his theological studies at Trinity Evangelical Divinity School in Deerfield, Illinois completing his Master's degree in Interdisciplinary Studies at Regent College, University of British Columbia, Vancouver, BC Canada with a dissertation on the Idea of Man in the writings of Alexander Solzhenitsyn. Virtue was Religion Editor at The Province newspaper, Canada's third largest morning daily, and later an editorial writer. He was international communications coordinator for World Vision Int., serving in Ethiopia. He worked in communications and development for the American Bible Society in New York City, and later served with the American Leprosy Missions spending time in India. He is an ordained Baptist minister (ABC-USA) and was associate pastor of St. Paul's Baptist Church, Montclair, NJ, an African-American congregation for two years. He was Managing Editor of the Virginia Churchman and has been a columnist, journalist and writer on religious issues for more than 40 years for numerous periodicals including Christianity Today, First Things and Forward in Christ. For 8 years he was president of a high-tech media corporation at the same time editing an Episcopal newsletter for orthodox Episcopalians in Pennsylvania. 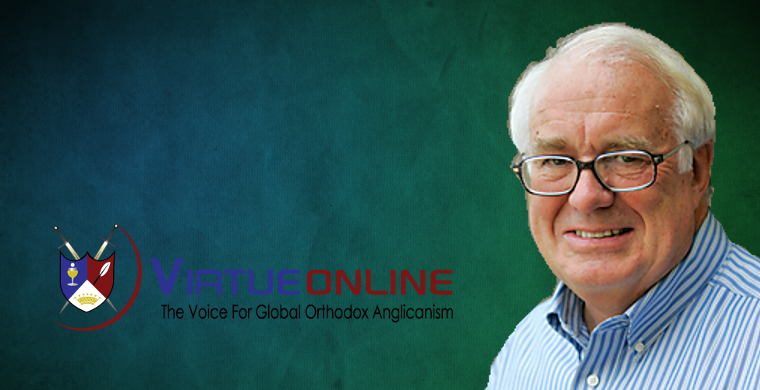 In 1995 he formed VIRTUEONLINE an Episcopal/Anglican Online News Service for orthodox Anglicans worldwide reaching nearly 4 million readers in 204 countries. He is the author of three books, A Flame for Justice, on the life of Caesar Molebatsi of Soweto, South Africa (Lion Publishing, Oxford, UK), A Vision of Hope, the life story of the Rev. Dr. Samuel Habib, Cairo, Egypt (Paternoster/Regnum, UK) and HOMOSEXUALITY: Good and the Right in the Eyes of God? The Wedding of Truth to Compassion and Reason to Revolution, F. Earle Fox & David W. Virtue. He and his wife, Mary lived in West Chester, Pennsylvania for 27 years where they attended the Episcopal parish of the Church of the Good Samaritan in Paoli, PA. Now resident in Philadelphia, they attend Christ Church Anglican on the Mainline, Wayne, PA a church plant of the Convocation of Anglicans in North America (CANA). CANA is a missionary jurisdiction of the Church of Nigeria [Anglican Communion] and the Anglican Church in North America (ACNA).